As far as errands go, stopping for gas is really pretty easy. In Oregon, where state law requires that an attendant dispense the gas, you just roll down your window and say Fill her up with regular and soon enough you’re driving cross-country. The pay off is huge considering the tiny effort you expend. Yet somehow this simple task can feel like a real nuisance. But if I thought stopping for gas was pesky in my car, in the Biotruck it’s a Homeric ordeal. First off we have to find a station that dispenses biodiesel. There aren’t that many. Selling biodiesel is a tough business, the domain of dogged dreamers and innovators, so unless you’re driving through certain idealist epicenters like northern California and Oregon, you can find yourself at a loss. Then it has to be the right kind of biodiesel—not the stuff made from crops grown specifically for biodiesel, like imported palm oil. We don’t want our journey powered by valuable farmland and food resources. We are in the market for fuel made from waste cooking oil. If that didn’t whittle the options enough, then we have to find someone who likes what we are doing enough to fill our tank for free in exchange for advertising on our bus. The Biotruck’s holding capacity is 300 gallons, so it’s a Big Ask. Andy picks up the phone and in 100 words or less must pitch our cause to the producer in a way that appeals to their adventure fantasies yet avoids stirring a bitter realization that while he/she is scraping grease traps all day in bib-overalls, we’re freeloading our way around the world. Except to say free-loading is inaccurate. Sure we haven’t paid out any hard cash, but to get our fuel, we’ve made some compromises. Stopping for gas in Kuala Lumpur, we got roped into a 3-way promotional gig with a biodiesel company and a 5-star “eco” hotel. The concept sounded great over the phone: we’d park the Biotruck in front of the downtown high-rise hotel to attract attention. The TV news would come interview us, we’d wear the company T-Shirts, and the hotel would be visible in the background. Everyone wins. But when we pulled the Biotruck into the circular drive in front of the lobby, the marketing director greeted us with a tense smile. Like two cyber lovers who court online only to realize face-to-face that they actually look nothing like their picture, it was a strained moment. The Biotruck with its rusty frame, cracked windshield, and wafty compost toilet was not exactly what they had in mind. But the disappointment was mutual. Their 5-star notions of “eco”–floors made of rice-husks, refillable shampoo bottles– did not make up for the sheer exorbitance the place. Still, they followed through on their agreement to comp us a room for a couple of nights and so we abandoned our grimy-but-lovable Biotruck and on the 23rd floor swaddled ourselves posh white towels and crisp sheets. Andy leaned back and swiveled around on the leather black office chair like an entitled CEO, while I swam laps in the rooftop infinity pool like a trophy wife. But the story doesn’t end there. The biodiesel company then offered to rebuild our truck into something shinier and more marketable. In exchange, we would become the company’s mascot. It was an attractive offer and we spent a lot of time in the lounge discussing the potentialities in view of the Patronas Towers during the hotel’s happy hour. But just as I was consigning myself to living in Kuala Lumpur forever, the deal fell through. We got our promised fuel and were happy to return to the Biotruck and resume our adventure. It was a stop for gas that not only took a week, it almost rerouted our lives. Last week we found a station in Temecula, California that fit our criteria. Promethean Biofuels agreed to full our tank for free so it was worth the detour. On arrival, we were directed to park in the recycling yard around back. There we waited amid the shattering sounds of dutiful home recyclers hucking their glass jelly jars and beer bottles into the correct bins. An hour went by while I wrote, tidyed, up, and staved off an encroaching headache with a few deep breaths. Eventually, the manager Todd popped his head in the door with a huge smile. He led us into the biodiesel plant. 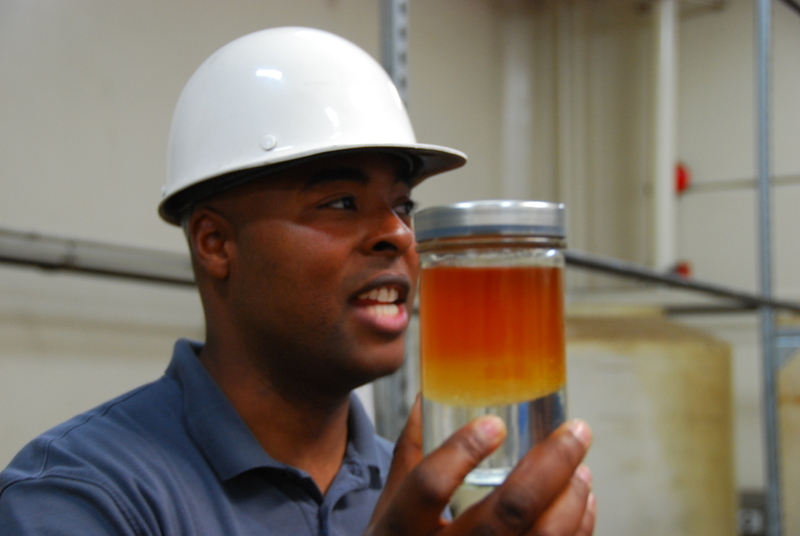 He was giddy to show us the facility–the filters, grease traps, gauges, and collectors. He explained in detail every step of the fuel-making process from collection to processing to dispensing. While he spoke, he held glass jars of fuel up to the lights and ogled them like pure honey This was all stuff I want to know—I’d grown long tired of referring all the techie questions to Andy–but despite Todd’s infectious enthusiasm, it was hard to absorb the information. My critical thinking faculty hadn’t felt this battered since high school chemistry. My attention wandered. I brought it back. The shadows outside grew long while Todd launched into an extended explanation about energy efficiency–something about how ethanol and methanol would separate into biodiesel and glycerine all on their own, but to meet the current fuel demands, he has to add heat to accelerate the process. His point being that humans-in-a-hurry mean that more energy must be expended to speed up what would otherwise happen naturally. I shifted my weight from leg to leg, practiced my bandha exercises, and nodded my head. The sun was setting as we finished up a tour of the plant. Todd wheeled a barrel of fuel over to the Biotruck. Andy readied the hoses and tank. The fuel suction hose was broken. Fifteen minutes later he had it fixed and at last the Biotruck drank in 75 gallons of fuel. It was clear that our plan of camping in the mountains that night was off, so when Todd’s wife arrived it made sense to take them to dinner. Wendolee was gorgeous, wore heels, and had an uncommon charm. I loved the fact that she was a Mexican singer and she was thrilled to meet the only gringa in America that listens to Vicente.Fernandez. Together the four of us browsed the faux Wild West streets of Temecula looking for the right restaurant. Andy didn’t really care what we ate, but wanted a place with swinging saloon doors. We didn’t find the doors, but we did find a few spellbinding martinis that fueled the best nights any of us had had in a while. Before the night ended, Todd leaned forward. You’re sitting with a bit of a star, you know. It turned out that Wendolee is a pretty famous popstar in Mexico and her latest album was a week away from being released on iTunes. In the morning we’d wake up hung over and look her up on You Tube. Sure enough, we’d been hanging out with a Big Star. There she was, dancing and singing in a music video. So when traveling in the Biotruck, this is stopping for gas thing is not a perfunctory five minute nuisance, We don’t just turn up at a station, say hand over the fuel buddy, and drive off to our intended destination. Getting gas is often multi-day affair that has us joking that the Biotruck is not just powered by wasted oil but also by wasted time. Except it’s not wasted. Sure we have to hunt down a station, plea our case, and drive out of our way. But we never know where it will lead us. One moment we think we are just stopping for gas and the next we’re about to move to Kuala Lumpur for the rest of our lives. Or, we are topping off our tank and then suddenly laughing over martinis with a Mexican popstar and a biodiesel maker who helps you to realize just what a damn miracle fuel is. These kinds of things never happen at Chevron. Thanks and cheers to our great new friends Todd and Wendolee.